Possibly Anon. Sale, Hôtel Drouot, Paris (organized by Febvre), April 8, 1854, lot 14 as Boucher. Baron Cassel van Doorn; sale, Parke Bernet, New York, Dec. 6, 1958, lot 96 as Boucher. with Galerie Cailleux, Paris, as Boucher, from whom purchased by the present owner. A. Michel, François Boucher, 1906, no. 1160 as Boucher. P. de Nolhac, François Boucher, Ier peintre du roi, 1907, pp. 79, 130 ff., illustrated p. 132 as Boucher. B. Davidson and E. Munhall, Catalogue of The Frick Collection, 1968, II, p. 21 as Boucher. A. Ananoff, François Boucher, 1976, II, p. 70, no. 368/12 as Boucher. The Burlington Magazine, Dec. 1977, supplement, pp. vi-vii, fig. 5 as Boucher. London, Cailleux, Paintings & Drawings of the Eighteenth Century, Burlington International Fine Art Fair, 1977, as Boucher. New York, Stair Sainty Matthiesen, François Boucher: His Circle and Influence, (ex-catalogue), as Boucher. 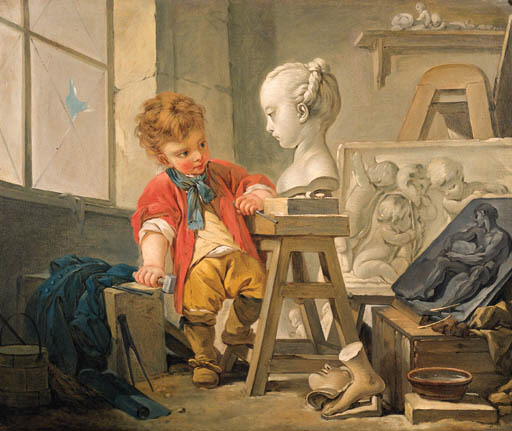 The subject of this picture, a child in the guise of a sculptor at work in his studio, is related to one of eight panels that are today in the Frick Collection in New York. In that celebrated suite of decorations, each panel consists of two superimposed allegorical scenes - the top oval, the lower rectangular - separated by small landscapes in cameo, and framed within a floral arabesque. Each personification takes the form of a contemporary genre scene with children acting out adult roles that emblematize one of the Arts or Sciences. Although nothing of their early history is certain, it has long been believed that the Frick paintings were executed for the Marquise de Pompadour around 1750-2, and installed in one of her châteaux, probably either Crécy or Bellevue. Certainly their iconography would have flattered the great patroness of the Art and the Science, and children were among her favorite subjects for painting. The present picture differs from its model in several ways: it is a horizontal rectangle in format, rather than a vertical arabesque; the scene is presented much closer to the picture plane; and certain elements of staffage - the broken windowpane, for example, and the bucket and broom - do not appear in the Frick panel. The bust of a girl that the little sculptor in the present painting is working on may represent Madame de Pompadour's daughter, Alexandrine; it is, in any event, based on a sculpture by J.F.J. Saly exhibited in the Salon of 1750. The bas-relief with putti that sits on the easel is inspired by Duquesnoy's well-known relief, Children with a Goat, that also appears in paintings by Desportes and Chardin. Both the Frick Sculptor and the present painting, Alastair Laing believes, probably derive from a lost original canvas by Boucher which would also have served as the model for chair-back tapestries woven at the Manufacture de Gobelins, one example of which is in the Huntington Art Gallery in San Marino. A black chalk drawing of the young sculptor in the Frick Collection was acquired by the museum in the 1960s; its format is closer to the present painting than to the Frick panels, however, and it is dated '1761' (Ananoff, op. cit., no. 368/9). Cailleux suggested that the drawing was made in preparation for the present painting, but it has the appearance of a ricordo, rather than a study, and it probably emanated from Boucher's studio and not from the artist's own hand, as Alastair Laing has noted; it is possible that it too was made after Boucher's lost original painting. Certainly, Boucher's workshop would have been involved in translating the young sculptor into various media, as Laing has observed, and the entire issue of studio participation in Boucher's paintings remains a complicated one. The vigorousness of handling and certainty of draftsmanship in An Allegory of Sculpture are in keeping with Boucher's works in the last decade of his life, however, and a comparable painting in a private collection (Ananoff, ibid., I, p. 288-9, no. 663, Pl. LV) -- an Allegory of Chemistry, also related to the Frick panels -- is fully signed and dated '1769', a year before the painter's death. The present painting would, therefore, appear to be an autograph late work by Boucher with the likelihood of some workshop assistance; an opinion that is supported by Mr. Alastair Laing, who knows the painting from photographs.